From an early age, we are taught that the ones that are wearing your same color are your teammates and the ones that are not are your adversaries. As social beings, feeling connected to social groups or identifying oneself as part of a group, like a football team, gives players a mood boost and is well known to give people a stronger sense of purpose, support and security. A football’s uniform and its protective pads are as necessary as a players skills, talent, and heart. It doesn’t really matter if it is an amateur, semi-professional, or professional match, wearing matching jerseys is essential. 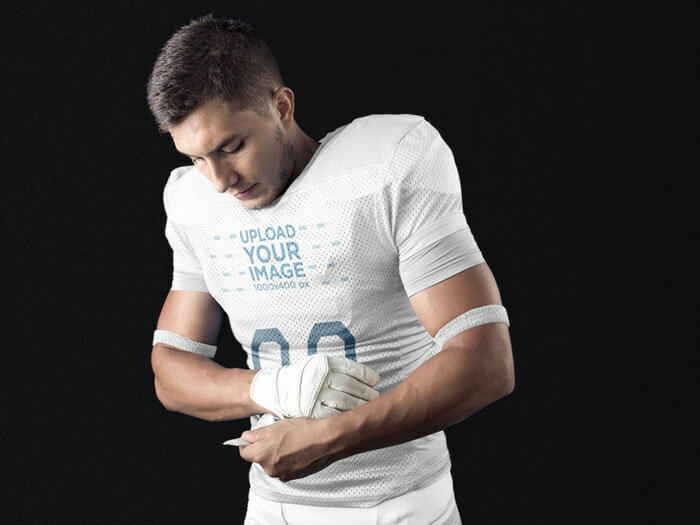 In this blog post, I will show you how easy it is to create football jersey mockups that will help you decide on how you and your team will want your new football team uniform to look. With Placeit’s football jersey generator you can get creative straight from your browser. No plugins, no heavy PSD files, just your browser you are already familiar with and that’s it. It is as simple as uploading your team logo, typing in your desired jersey number and adding color to the editable elements of the jersey on the screen. If you don’t have your logo yet, check out our sports logo design. Choose a Football Mockup Template. Upload, crop and position your custom football team logo design in PNG or JPEG format. Pick your jersey, shoulders, pants, arm bands, and facemask colors. Download your new custom football jersey mockup! Once you are happy with what you see on your screen you can download a high-resolution image you can share with your team and your football uniform supplier. That’s it! Check the results! 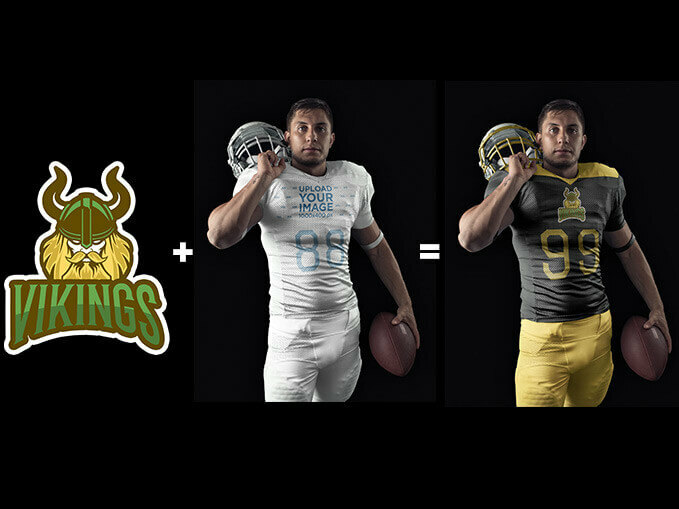 The football jersey maker makes it super easy to picture your next custom football team jersey. Fundraising for a new team jersey or uniform can be difficult because it is not easy to convince by just saying and proposing. With Placeit, you can now show and make your life easier! We actually have a guide that takes you through the steps of designing, purchasing and promoting your team using your new team uniform. At Placeit we have these pain points in mind. There’s many of us who have absolutely no idea of how to use Photoshop to create this kind of mockups that will get our point across. Some may argue that a PSD file has more editing options but that also means that there are more possibilities of doing it all wrong and ending up having nothing. With Placeit’s football jersey maker, you have just the right amount of customization options with a friendly interface that will help you create the custom football jersey mockup that you need. With the best visual assets on your side, convincing your teammates, customers, and other interested parties will be easy as pie. Immerse them in the idea of wearing super cool new uniforms the fastest and easiest way possible. Remember that it takes no more than a few minutes to create photorealistic custom football jerseys. With Placeit, you are just a few clicks away from a custom football jersey design that looks professional and works like a charm. You can access and customize your own football jerseys for FREE with our uniform visualization tool. When you are ready to purchase, you’ll just pay $8 USD for a super high-quality image file free of watermarks or subscribe to Placeit’s Unlimited Subscription to get all the mockups, branding assets, logos and more for only $29 a month! What Other Sport Mockups Are Available in Placeit? Placeit currently has baseball mockups, volleyball mockups, soccer mockups, basketball mockups, and many more sport uniform mockups are soon to come. Stay tuned! A football jersey is what marks a player’s allegiance to a team. 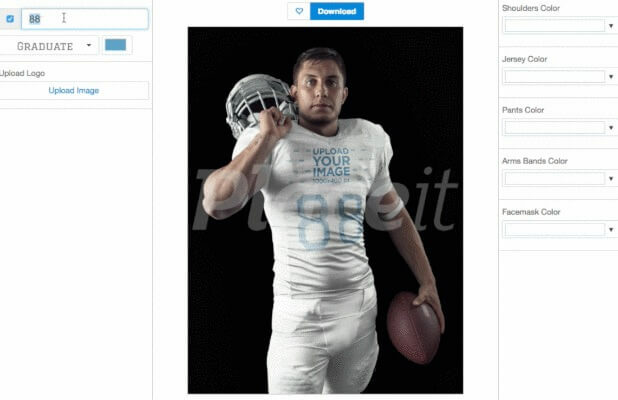 Build a great, committed team from game one with Placeit’s football jersey mockups. Wondering where to order your jerseys from? We created a list with the best websites to order custom football jerseys for your team, also, don’t forget to try out our awesome football logo maker or create Super Bowl merch and cheer your favorite team, and while you’re at it, why not check out our Quick Guide to building amazing sponsorship packages, get that sponsor you’ve always wanted! 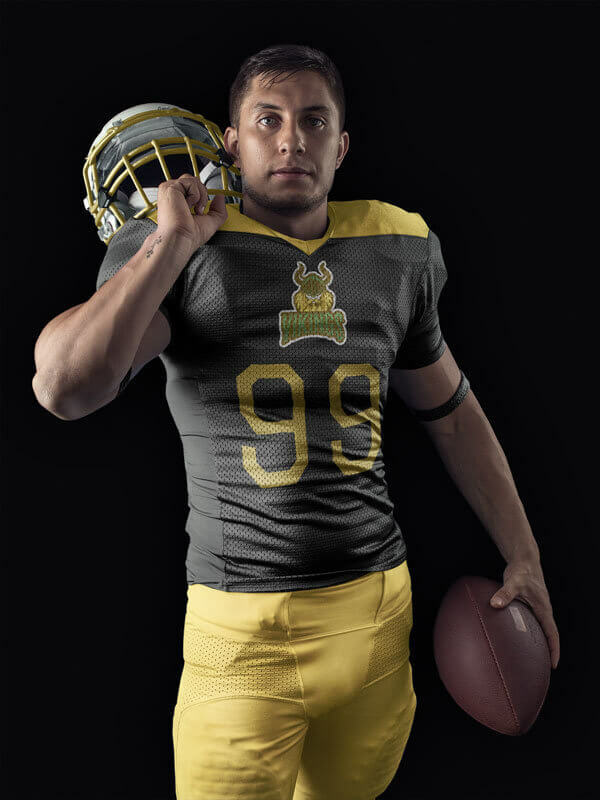 Ready to create custom football jerseys? Visit Placeit and browse the full gallery!